When the rush of regular life leaves you breathless by day’s end, this collection of everyday stories becomes the place where you can come as you are, and find yourself among friends. Friends who have been there. Friends who’ll lean in close and say, “Me too!” Through our stories the bonds of friendship deepen as we listen to each other, laugh with each other, and learn from each other. Because we’re better when we’re living this one beautiful life together. With stories from 80 writers, these pages become the very place your soul can exhale, where you can: · Connect with the hearts of women through stories that echo your own.· Find beauty in the ordinary and sometimes messy moments of your everyday life.· See your own stories as an offering of hope to those around you.· Treasure the unseen ways God moves through even your most regular days. 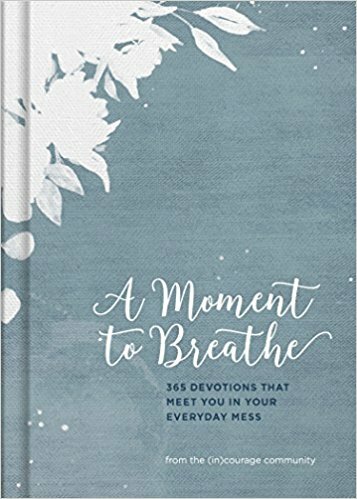 With 365 readings, each day begins with a passage of Scripture, tells a story of everyday faith, and encourages you to take a moment to breathe with a simple but fun way to complete your day. So kick off your shoes and join us for a relaxing but special time, where friends come together and share the real stuff of everyday faith. This is such a wonderful devotional. It's visually beautiful with a lovely cloth cover and blue lettering inside. I love beautiful things and this definitely is beautiful. Better than the pretty look of the book are the amazing devotions for each day that will really bless your heart and draw you closer to the Lord. These are written by several different women so there is a devotion that will touch you right where you are. There are 365 devotions in this book and they start with a Scripture and then a wonderful heart-felt devotion. They are short but they will so impact your life. My favorite part is at the end of the devotion. There is a question for you to ponder or an idea for you to implement into your life that day. I really like this devotional and I think you will, too. I give it 5 out of 5 stars.